RUSH: So it’s all over the place now that the White House lied about the Benghazi talking points. Ladies and gentlemen, the Benghazi story has now escaped conservative media, and it’s all over everywhere now. I shouldn’t say all over. It’s out there. It is everywhere. Greetings, folks, it’s Friday, and you know what that means. RUSH: Well, yesterday when we opened the program, I honestly said there wasn’t much going on. And there wasn’t. The big news yesterday was Jodi Arias and the Cleveland Castro story. But today it’s Benghazi and the IRS. So where to begin with this. I guess the buzz today about Benghazi is over a report by Jonathan Karl. But the actual beginning of this, if it weren’t for Stephen Hayes at the Weekly Standard writing the story in a way that for some reason was attractive to Jonathan Karl of ABC, it might not have escaped conservative media. For example, I just got a note from somebody who said that Scarborough, who is increasingly difficult to decipher, Joe Scarborough at MSNBC this morning said that we’d have been much further along in the Benghazi story if right-wing media hadn’t overplayed it. Now, as often happens with Scarborough, he has inadvertently swerved into a decent point — 50%. It is true. I don’t think it is deniable, whenever we, I, conservative media, are really interested in something, the mainstream media purposely avoid it. They mock us for being interested. But they use, almost as a guidepost, anything that’s happening in the country — I don’t care, could be news, cultural, social, political, whatever it is that we are interested in, focused on, trying to call your attention to — they purposely avoid it because we’re pushing it. They have been, I think, moved into the area of journalistic malpractice. My friend Andy McCarthy asked a question today in a post at National Review. Does the White House press corps have any self-respect left? Sometime during the administration of Bill Clinton, these journalists went from seeing their job as watchdog keeping Democrat government honest to admiring raconteurs of how artfully they were lied to. Remember that? He’s right about that. They marveled at how well Clinton lied. They appreciated it, they studied it, and they learned it. And, they put it into practice. One of the reasons I’m convinced the Monica Lewinsky story was spiked was because they knew we’d run with it, and then when Drudge did finally run it, look how long it took them. They were dragged kicking and screaming to the Lewinsky story, and they’ve been dragged kicking and screaming into the Benghazi story. Now, the difference where Scarborough’s wrong is, had we not made a big deal out of Benghazi, it would have been forgotten. They would have buried it. So the idea that we woulda gotten to the Benghazi story a lot sooner if “right-wing media” hadn’t overplayed their hands is literally nuts. It’s crazy. One thing I want to add at the top in beginning this discussion today and letting you know where it is, the focus still remains on Hillary Clinton, as it should. But, folks, I’m telling you the real focus of this is Barack Obama. And it’s gonna end up being Barack Obama. This is not to excuse Hillary, and it’s not to lessen her involvement, and it’s not in any way to suggest that her involvement is insignificant, by no means. But Obama should not get a pass on this. Where he was during this event is the fundamental question. And at some point that question also is going to be asked. Right now the focus is on Hillary and the 12 rewrites of the talking points, 12 rewrites of the regime talking points that were used by Susan Rice and others explaining what happened, the video as an excuse and all that. The focus right now is the State Department, but at some point this is going to build, and it’s going to expand because it must, if they stick with this, this actually becomes something they stick with. At some point they’re gonna have to get to Obama and what he was doing and where he was because he’s the only guy that could issue the stand-down order. He’s the president. He’s the only guy that can order military action or no military action. So he’s not gonna get a pass. Certainly not here at the EIB Network. Now, Stephen Hayes at the Weekly Standard a week ago essentially had the story, the essence of this news about the talking points being rewritten a grand total of 12 times so as to be flavored and shaped and formed to be the least damaging to the administration. And we must remember that the talking points, the fraudulent talking points were the basis for the appearance on the Sunday talk shows by Obama’s ambassador to the UN, Susan Rice. She pretended, on behalf of Obama, not Hillary, she pretended on behalf of Obama that this was nothing more than a spontaneous ad hoc protest provoked by some scoundrel Islamophobe who made a video that nobody at the time had seen. The administration knew, they knew from intelligence that was supplied from the compound throughout the siege. We’ve been through this. You know all of this. But this is just now, the fascinating thing, everything I’m telling you, you know. You’ve known this for months. You’ve known this since before the election. The Drive-By Media is just getting to this, just now. You know that Susan Rice was lying. You know that she was lying on behalf of Obama. You know that they made up this business about the video. You know that the administration knew the night of the attack what was going on. The State Department knew at the time of the attack it was Al-Qaeda. The White House knew at the time of the attack it was Al-Qaeda. That’s what’s been so maddening about this, everybody knew. Dare I say the mainstream media knew. But the White House line was it was a video, so they parroted that knowing full well what really happened. Jonathan Karl, ABC News, now reports that talking points went through 12 different rewrites, and something very key was eliminated, and that was all references to Ansar al-Sharia, the al-Qaeda-related group that did the terrorism. Ansar al-Sharia is the local al-Qaeda group that orchestrated the entire Benghazi operation. Jay Carney lied. The rewrites, these talking points were subjected blatantly. They blatantly contradict what Carney was saying. This is a remarkable development to happen here, and it does illustrate the importance and the relevance of the media. It’s like I said yesterday (I might even been talking about Benghazi), “Nothing’s gonna happen here, folks, ’til the media gets on it. Nothing is gonna happen.” I remember telling you yesterday that nothing is gonna happen. Well, overnight something happened. Let’s let you hear it. Let’s go to the audio sound bites. We’ve got two bites here from Jonathan Karl. You might say that this is the smoking gun. This is Good Morning America today. Jonathan Karl is the chief White House correspondent for ABC News. We don’t know for how much longer, but he had a report this morning on GMA. We have two sound bites 26. KARL: The White House said they relied entirely on CIA talking points, but I’ve obtained 12 different versions of those talking points that shows that they were dramatically edited by the administration. Take a look at two of them. On the left, a draft initially written by the CIA. On the right, one that was used by the White House, the final version. What was taken out? 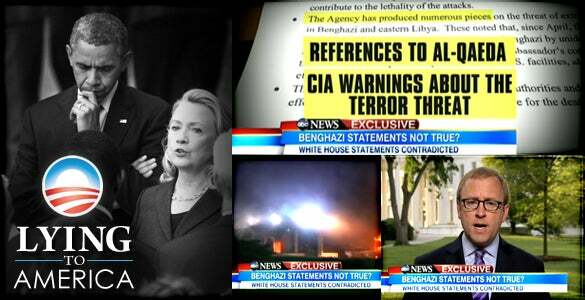 All references to al-Qaeda and all references to CIA warnings before the attack about the terror threat in Benghazi. RUSH: They knew, folks! They knew, and now ABC has dumped it. They knew it was Ansar al-Sharia (an al-Qaeda “franchise,” if you will) in Benghazi, in Libya. They knew. They knew that there were warnings before the attack, that the CIA had issued warnings before the attack about the terror threat. They knew it all. Obama knew it all. Hillary knew it all. They studiously crafted a series of lies about a video. KARL: I have had e-mails read to me that show that many of these changes were directed by Hillary Clinton’s spokesperson at the State Department, Victoria Nuland. In one e-mail she said that information about CIA warnings, quote, “could be abused by members of Congress to beat up the State Department for not paying attention to warnings. So why would we want to feed that?” After that e-mail, all of those references were deleted. Now, the White House is saying there is nothing inappropriate about the State Department giving input into this and that ultimately the CIA drafted these talking points and approved them. But I’ll tell you, Josh, they initially said only one word had been changed. RUSH: Right. They said “only one word had been changed.” The whole story was made up. The real story was swept under the rug. Twelve edits, 12 rewrites, if you will; the whole story swept under the rug. We were told that the talking points were revised, were edited to protect national security. Instead, they were edited and revised to protect Hillary Clinton and Barack Obama — and, about that, there can be no doubt now. But it’s not just ABC that has this story. Ron Fournier, former White House correspondent and AP bureau chief now at the National Journal: “Scrubbing the Truth from Benghazi — Caught playing politics with tragedy, what’s next for the Obama administration and GOP investigators?” Ron Fournier is now saying the White House was playing politics with Benghazi. That makes Obama a liar, according to this story. You remember in the debate, one of the three presidential debates, Obama told Mitt Romney and the country that he would never play politics with Benghazi, not with four dead Americans — and he was outraged that there would be any such accusation? His administration “would never play politics,” and that’s all they did it because that’s all they do. Everything they do is politics. “‘These changes don’t resolve all of my issues or those of my building’s leadership.’ With that sentence, one in a series of e-mails and draft ‘talking points’ leaked to Jonathan Karl of ABC News, the Obama administration was caught playing politics with Benghazi.” Caught playing politics. I’m reading to you from Fournier: The regime was “caught playing politics with Benghazi.” It’s not just ABC. In that second presidential debate, President Obama said, “[T]he suggestion that anybody in my team, whether the secretary of state, our UN ambassador, anybody on my team would play politics or mislead, when we’ve lost four of our own, Governor, is offensive.” It is exactly what happened. One other thing. Lisa Myers, NBC News, says a number of Democrats are calling her to attempt to undermine Gregory Hicks, the Benghazi whistleblower. “There is something called Benghazi going on, and I think the Democrats now are starting to worry about it. I started — I got calls from a number of Democrats yesterday trying to undermine Greg Hicks’s testimony, saying he wasn’t demoted, etc. So I think they feel that some damage was done by those three witnesses on Wednesday.” I think it’s safe to say the Democrats may be in full-blown panic mode. RUSH: So it turns out, ladies and gentlemen, Benghazi may be too big to bury. I’m serious. By the way, this is no feather in their cap, but I’m telling you: The Drive-By Media will pay attention to what we’re interested in as conservative media, and, for that reason alone, they’ll avoid it. The reason they will avoid it is simply so that we don’t have a win. They will subordinate their own integrity; they will subordinate their own jobs, their own professionalism. They will subordinate their own self-respect just to deny us what they would consider a win and themselves a loss. So they looked at Benghazi, and they see big trouble for Obama. But we’re the only ones talking about it, so they ignore it for that reason, plus the possible damage to Obama. The fact remains, they participated in a cover-up of four murders after the fact, and in a sane world Mrs. Clinton should now be disqualified from holding future public office. I don’t care what the real story might be, and there may be something we don’t know yet about what was going on. This doesn’t cover it. RUSH: Now, folks, there’s much more than just Benghazi happening out there. We’re gonna get back to it in just a second. But let me give you a little flavor of some of the other things happening out there today — and I have not forgotten. I asked to be reminded that I wanted to make a point about the politics of Benghazi. Now, all I was gonna say about that is the Democrats are accusing the Republicans in their investigation of Benghazi and the hearings with the whistleblowers two days ago, of being politically motivated. As though that automatically disqualified whatever happens because, “Well, it’s just ‘political. '” In the first place, it’s not just political. There is an actual effort underway to find out what happened. That effort has been underway since the night of the event, last September. Serious people have wanted to know what really happened, and our interest in what really happened has been intensified by virtue of the number of lies we’ve been told — and we have been lied to constantly. Now, everybody in this audience, all of you, none of what you’re hearing today is new to you. Jonathan Karl might be surprised to learn that the talking points were edited 12 times. You’re not. Ron Fournier might be surprised to learn whatever it is he’s learned, but you’re not because you’ve known all about this ever since the event occurred in the immediate aftermath because we chose to talk about it. The idea that looking into this is “political” and therefore it’s disqualified is absurd. The Democrats and the White House have made it political. In fact, what’s guiding them in their effort to spin this and cover it up was politics. Washington is politics! Somehow if people have political objectives, then those objectives are automatically disqualified? If that’s the case, the Democrats have no business being legitimized about anything because everything they do is political. But the idea that we have to ignore what Greg Hicks said or any of the other whistleblowers because the Republicans are motivated by politics? It’s crazy, it’s ridiculous, it’s absurd. We’re motivated by a number of things. Yeah, there’s politics going on here. Some people say, “Well, Rush…” I’ve had people e-mail me, “Rush, there may be a problem but there’s no scandal here.” Yes, there is a scandal. By what definition is there no scandal here? This is a huge scandal. I’ll tell you what: In this case, the cover-up is not worse than the crime. Ever since Watergate, the conventional wisdom has always said, “Yeah, come forth and be honest. Because, when you try to cover it up, that’s when you get into real trouble. The cover-up is often worse than the crime.” Not in this case. They’re equally as bad. RUSH: Well, this is rich. Get this. I wonder if this guy talked to Joe Scarborough. Tommy Vietor. (It’s V-i-e-t-o-r. I’m gonna pronounce it “Veet-er.”) Tommy Vietor, who is Obama’s former National Security Council spokesman, is tweeting that Republicans forced the administration to create the talking points. … I think that what we have here is an admission that the White House lied to Congress. Because this guy, Tommy Vietor… Again, I don’t know how he pronounces it. It might be “Vite-or.” I have no idea. V-i-e-t-o-r. Obama’s former National Security Council spokesman is now tweeting that Republicans forced the administration to create these talking points, the 12 revisions. The 12 edits of the talking points, Republicans made ’em do it. He said the Benghazi talking points were written at the request of the House Intelligence Committee, the House committee Republicans, so they could go on TV. Congress forced the administration to do them. Holy smokes! This takes the cake. Those mean, dastardly Republicans! So these talking points are lies, and the Republicans made ’em do that? These talking points were not just given to Susan Rice to lie to the US public, this whole business about the video. They were given to the US Congress. Folks, look just to review, very quickly. On the night of the Benghazi attack, everybody on the ground in Libya, everybody in Washington knew it was Ansar al-Sharia, it was the al-Qaeda franchise in Libya. Everybody knew it. The White House knew it. It’s now clear. This is not me or anybody else in the media asserting it. It is the media reporting it, and everybody knew it. It was immediately concocted by the regime. “We can’t have this known,” for all the reasons that we discussed since last September. “Well, Obama had beaten back al-Qaeda. Well, we couldn’t have terror attacks going on in Libya because we couldn’t respond to them. We’d be against the government of Libya, and we’d embarrass them if we launched military-style attacks. It’d make everybody look bad, so we can’t do that.” You know, whatever reasons that they came up with. By the way, there’s another one out there that I first mentioned to you last fall. As far as I’m concerned, it doesn’t change anything. It is that the real reason that our ambassador was in Benghazi was to begin a gunrunning operation to Syrian rebels. You remember my telling you about that way back last year, last September, last October. This is one of the first things that surfaced as people were scratching their heads and trying to find answers. What in the world was the ambassador doing? Why was there no security? Why was there no assistance?” Well, because there was a clandestine operation going on and we couldn’t have anybody know about it. “Well, what was that?” Well, Obama was trying to get some weapons and ammo to the Syrian rebels under the cover of darkness. You know, kind of like Reagan and the Contras.” Oh, is that right? So that’s supposedly gonna change things? Oh, okay. So that’s why we couldn’t make an effort to save the ambassador’s life. That’s why we made up this whole lie about what the attack was, that it was a spontaneous protest, because we couldn’t have anybody find out there was a secret plan to arm the Syrian rebels? By the way, this is just speculation. Nobody has confirmed this. If you hear this today, I just want to remind you that this is something that popped up last fall that people were speculating about. Nothing has really changed here, other than today Tommy Vietor is now blaming the Republicans for making the regime rewrite the talking points. And again, the talking points we’re talking about… Grab sound bites one and two and just play ’em back-to-back. This is what this is all about. This is Jonathan Karl on Good Morning America today. KARL: I have had e-mails read to me that show that many of these changes were directed by Hillary Clinton’s spokesperson at the State Department, Victoria Nuland. In one e-mail she said that information about CIA warnings, quote, “could be abused by members of Congress to beat up the State Department for not paying attention to warnings. So why would we want to feed that?” After that e-mail, all of those references were deleted. Now the White House is saying there is nothing inappropriate about the State Department giving input into this and that ultimately the CIA drafted these talking points and approved them. But I’ll tell you, Josh, they initially said only one word had been changed. (snorts) Right wing overplaying it? If the right wing hadn’t paid any attention to this, this would have gone the way of global warming long ago, and it would now have become an established hoax. The mainstream media would have ignored it, and nobody would be talking about it if we hadn’t been. Now, this Victoria Nuland that Jonathan Karl cites, Hillary Clinton’s spokesperson at the State Department? She admits lying to Congress in these e-mails. You just heard Jonathan Karl say it. In an e-mail to officials at the White House and intelligence agencies, Victoria Nuland took issue with including that information because, quote, it “could be abused by members of Congress to beat up the State Department for not paying attention to warnings. So why would we want to feed that?” So (translation), “We kept the truth out of this because we don’t want to be beat up by it or over it,” and now the Republicans did it! It’s Republicans’ fault. CARNEY: (haltingly) The talking points that she used for those appearances that were provided by the intelligence community. Those questions have been answered. RUSH: You see? They came from “the intelligence community. Those questions have been answered,” and we had nothing to do with rewriting them. At this point, nobody admitted that they’d been edited 12 times or rewritten. You and I all knew it, but again today, Obama’s former national security spokesman says, “The Republicans forced the rewrite of the talking points!” I cannot say that enough. “Republicans made us rewrite these talking points! Republicans made us edit these things!” The State Department didn’t pay attention to any of the warnings, and that’s what Nuland and Hillary wanted to cover up. Nobody paid any attention to the warnings! That’s what the whistleblowers were trying to tell everybody two days ago. The warnings were ignored. There were warnings before the attack that al-Qaeda was gonna attack, and they knew this. During the attack they knew it was al-Qaeda, and they put out this false, fake story they sent Susan Rice out to tell. The news here, folks, today is that the Drive-Bys are on this. There’s really nothing new. Really the only reason I’m spending time on this today is to enforce the notion that everything you know has now reached the mainstream media. “Mainstream” is a loose description, ’cause I don’t think they are anymore. That’s a reference to Mrs. Clinton. “Up until yesterday, that was the Benghazi scenario following the death of four Americans, including our ambassador to Libya.” When you cover-up four murders after the fact, you likely go to jail, but, if you’re Mrs. Clinton, you retire with dignity and huzzahs and kudos, with great applause, and then you run for president with full media support. “The Obama administration has lied, stonewalled, bullied, and intimidated — the true marks of an open and transparent administration. And, with a few notable exceptions, the American media havenÂ’t just let them get away it. Heck, theyÂ’ve helped. Hill testimony of State Department whistleblowers might change that, but itÂ’s doubtful given the one-sided reporting so far.” This piece was published yesterday. The Obama administration has lied and stonewalled and bullied. “NBC said there was an ‘obvious political undercurrent’ to the hearings and accused the GOP of going after the ‘most popular Democrat,’ Hillary Clinton.” And therefore everything was happening was without merit. There’s a political objective here, and therefore whatever the Republicans are doing, we can’t pay any attention to. That was my point from yesterday. Just because it’s political doesn’t disqualify it. Who made it political, after all? The Republicans didn’t do any of this. They’re just reacting to it, like we all do to the left every day here. She had not written about Benghazi for five months or reported on it for five months, and CBS puts this story out about how she’s dangerously close to losing objectivity on this and getting into advocacy. I mean, that is tantamount ridiculous. That’s not what Hicks was trying to do! They’re trying to get the truth out of what happened. By the way, there’s something that needs a little bit more attention in this, and that is the president of Libya, and I will get to that before the program ends. That was two days ago ago. Now today it’s all blown up. So Jonathan Karl at ABC has this blockbuster Benghazi story today, and it does feed off of Stephen Hayes. But, in all candor, Karl added some things to it. He did advance the ball. He documented the number of revisions (there are 12 rewrites or edits; in fact, there may be more) and he also produced some of the quotes from Hillary’s spokeswoman Victoria Nuland. Nuland really ties all this to Hillary, by the way. Every time you hear her name you should think Hillary. Nuland didn’t do anything that Hillary didn’t tell her to do. So whenever you hear named Victoria Nuland in this, just substitute Hillary’s name for hers. That is made clear right here, from Jonathan Karl’s piece. Quote: “After the talking points were edited slightly to address State Department spokeswoman Victoria Nuland’s concerns, she responded that changes did not go far enough. “‘These changes don’t resolve all of my issues or those of my building’s leadership,’ Nuland wrote.” So when you see that name (it’s spelled N-u-l-a-n-d) or hear the name Victoria Nuland in this, substitute “Hillary.” CNN is even talking about the talking points now, as we speak. Jacob Tapper has been on this. So it has escaped what has been called “the Fox News ghetto.” There’s a conservative blogger out there who called it “the Fox News ghetto,” because Fox is the only one that covered the hearings. What is meant by that is the overall conservative media. Mike out on Long Island, I’m glad you called. You’re next on Open Line Friday. Hello. CALLER: How are you? I just wanted to disagree with you on one thing, you saying lying about Libya is just the same as the four Americans getting killed. I think it’s much worse. I think it takes it to a new level on how they think. By saying this video, it could incite riots, it could radicalize terrorists, it could do so much more than just the Americans that got killed, and I think that the people that spewed this lie should be held accountable, and maybe some jobs should be lost. I just can’t wrap my head around it. For some reason, I just don’t get it. RUSH: I am not trying to diminish the cover-up, but the conventional wisdom is if the cover-up is worse than the crime, come out and tell the truth. CALLER: Yes, and you are the loudest vocal person about it, and I just don’t see why other people aren’t getting it. I just don’t get it. RUSH: Well, I think give them time. RUSH: When you say other people aren’t getting it, specifically what do you want them to get? RUSH: Let me give you something to worry about. What would your reaction be if I told you most everybody who voted for Obama knew he was lying about it, didn’t care? CALLER: I know. And now some people I work with, you just say, “Benghazi,” they think it’s a person, “Ben Gazi.” I don’t understand. I don’t know where these people live. CALLER: — know you know more than other people, it’s like talking to a wall. It really is and it’s just so frustrating that this happened. RUSH: That’s why, sad to say, that it’s important that ABC has this now. Because the low-information networks are on the case. Now, they could drop it after the Sunday shows, too. They could say, “Okay, we’re gonna do this. We’re gonna cover it and then drop it and move on to something else.” Immigration, gun control, they could do this and drop it and say they covered it. It’s too soon to invest a whole lot of hope. Just take it one day at a time as it comes, and we’ll see what happens. There was something that happened within the past three weeks wherein the New York Times reported something factually that we have been asserting for a long time, and people were celebrating and clapping their hands, and it kinda made me mad that, oh, okay, so we still want validation from the New York Times. If the New York Times says it, then we can finally trust it, and it kinda ticked me off. I wish I could remember what it was. It was not something insignificant, but it was long enough ago that I don’t remember exactly what it was. But I do remember everybody celebrating and clapping their hands ’cause whatever it was had been confirmed by the New York Times. And there’s a little bit of that here. I mean, kudos to Jonathan Karl. I mean, he did advance the ball. He did move it forward. But a lot of this you and I’ve known since September 12th of last year. I’ll take it. I’m not trying to look a gift horse in the mouth here, ’cause it is what it is, but it’s still, just as an isolated thing, a little irritating to me that it takes ABC covering this for these nimrods that you’re talking about in New York to finally get it it. The normal low-information reaction when you bring up Benghazi, “Ah, it’s just the Republicans trying to get Obama. There’s nothing there. There never is. The Republicans, it’s all just political. They just hate Obama. They’re a bunch of racists and just don’t like Obama. They’re mad that he won and they’re just trying to get rid of him. There’s nothing here.” Just because it’s conservatives pushing it. It’s impossible for there to be anything factual about it. So here comes ABC reporting it, maybe even CNN, not a big deal there, not a whole lot of people watch. The big thing for New York could be the New York City Times, you know, if they got on this, then that would leave some of these people scratching their heads, but that’s the bifurcation of the culture that’s happened here. And up to now, the media has been doing everything it can to shield and protect Obama and Hillary. RUSH: It was the Pigford story in the New York Times. The New York Times did a story that the Pigford settlement was massive fraud, that a bunch of people that were not black farmers ended up being given massive welfare benefit repayments they didn’t deserve. This is a big Andrew Breitbart cause, and so people are saying, “All right, the New York Times has validated what we said!” It just kind of bothered me that we needed the New York Times. I understand it. Now, folks, I know you’re gonna find this incredible. The media, the left wing media, the White House, State-Controlled Media, on certain cable networks today where the Jonathan Karl/Stephen Hayes expose has finally reached them, MSNBC for one, they’re actually asking, “Why would the White House cover up Benghazi? Why would they cover that up?” I mean, various hosts and analysts are seriously asking themselves that question, as if they don’t know. “Oh, yeah, yeah, yeah, that makes sense.” As though it’s a first-day realization to them. See, in their mind, we have a messiah as president, and he would never do anything wrong. He wouldn’t lie. He wouldn’t make anything up. He wants to improve the job situation. He wants to make sure everybody has cheaper health care. He’s a wonderful guy and the country is loved again. Why would he cover anything up? They, until today, weren’t even able to entertain the notion. A cover-up, that’s what guys like Nixon do. Not our guy. Honestly. That is an accurate portrayal of what some State-Controlled Media people were talking about just today on their networks.